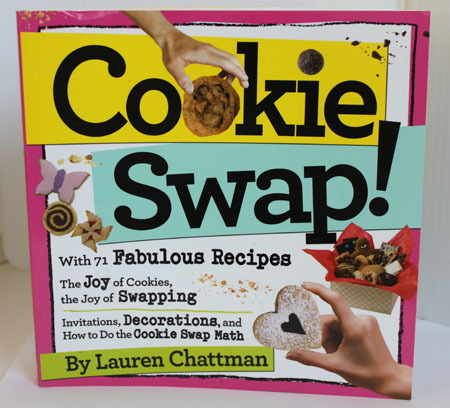 If you’re thinking about hosting a cookie swap or just looking for tips on how to do it better, Workman has a new book out which I heartily recommend – Cookie Swap! , by Lauren Chattman. For those new to the subject, a cookie swap (aka “cookie exchange”) is a party where everyone brings X number of cookies and Y number of containers and leaves with Y numbers of containers filled with XYZ number of cookies. Baking aside, the math alone can seem daunting, but Cookie Swap! solves the problem with Lauren’s easy to follow primer on “cookie swap math”. With that out of the way (or as Lauren quips, “Now that you’ve stashed away your abacus”) Lauren moves on to the creative and crafty side of cookie swapping which includes coming up with a theme, making invitations, and packaging ideas. In my experience, crafters have as much fun as bakers at cookie swaps, and Lauren’s planning tools such as checklists, calendars and sample invitations help ease the worrisome logistical aspects and leave room for the creativity. You can follow your own path, or borrow some of Lauren’s ideas such as a Mexican themed cookie swap with a pinata. But it’s not all party planning. This is a cookbook, and Lauren’s pastry chef background shines through in the “familiar with a twist” style recipes. There are 71 recipes arranged in groups including Drops, Bars, Pastries, Ice Box Cookies (a chapter she calls Refrigerator Madness, btw), Sandwich Cookies, Shaped and Cut, Slam Dunk (Biscotti), Cookies for Special Diets and Savory cookies. I’m still trying to fathom how Lauren managed to fit so many recipes, photos and tips into this book. It’s an 8 1/2 inch paperback that stays open on the counter and won’t take up too much space in the kitchen; And that’s definitely where you’ll keep the book because the recipes are worthy of year round baking. She covers the classics such as oatmeal raisin, blondies and brownies, but she’s also got a lot of cookies with creative twists, such as Midsummer Night’s Dream bar, Biscochito Icebox Cookies and Green Tea Cookies with Almond Cream. Next to the title of each recipe is a full color photo of the cookie so you can see what the cookie is supposed to look like. 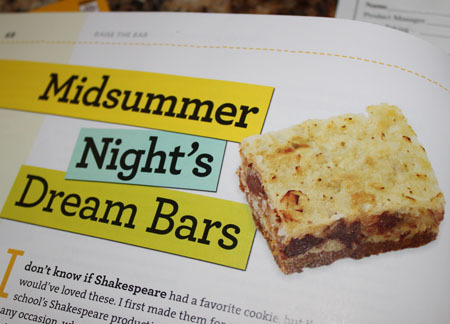 I made the Midsummer’s Night Dream Bars yesterday and mine didn’t look anything like the photo, but I left out over 2/3 of the coconut which explains why. I’ll post the actual recipe later. For now I can tell you it’s a book worth ordering in time for Cookie Swap season. I didn’t know that Lauren Chattman had a new book coming out so thank you for letting me know. It looks like a good book filled with wonderful recipes. I do think I will be joining Sue (from the first comment) at the twelve step program for people who have too many cookbooks 🙂 I am currently cataloging my books and it is quite daunting. I love cookbooks with pictures of all the recipes! Just when I thought I didn’t need another cookie cookbook! Actually, I just received Lauren’s last book “Cake Keeper Cakes” as a gift last week. It’s full of all my favorite bundt, crumb cakes, chiffon etc. I wonder if Fuzz would enjoy hosting a Cookie Swap? It’s not uncommon around here for the swap to be centered around girls in the 9-12 age group, as a way for them to have their own Christmas party. Off to add “Cooke Swap” to my wish list right now…thanks! Sounds like a great book! Is there a twelve step program for people who buy cookbooks and kitchen ware?